WINNER OF THE HFF18 “TOP OF FRINGE” AWARD! 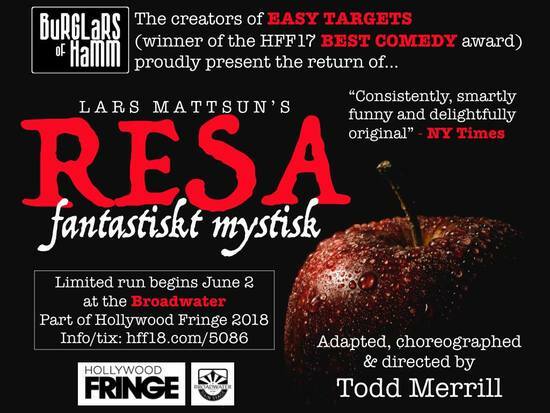 From the team who brought you the HFF17 Best Comedy Easy Targets, Burglars of Hamm are proud to present RESA FANTASTISKT MYSTISK. For the first time in 15 years, Burglars of Hamm will present their acclaimed production of this previously unknown masterpiece by Swedish playwright/provocateur Lars Mattsun (1849-1912). Through Mattsun’s surreal theatricality and stunning wordplay, the audience is engulfed in the tale of a troubled young man named Philip, who follows a Mysterious Child into a world of art, sexuality and madness. Much of the original cast and production team return, including controversial director Todd Merrill. Resa has played to great acclaim in Los Angeles, Seattle, Edinburgh and New York, and the Burglars are excited to bring it back home as part of Hollywood Fringe Festival 2018.